Scottish midfielder Andy Watson arrived at Elland Road in June 1983 from Aberdeen for a modest fee of £60,000. Born in Aberdeen in September 1959, Andy joined his hometown club following a spell in junior football with Sunnyside. Whilst at Pittordrie he picked up winners medals in the Scottish Cup and the European Cup Winners Cup at a time when Alex Ferguson’s side proved to be more than a match for the Old Firm giants from Glasgow. On a personal level, the midfielder played his way into the Scotland under 23 squad earning four caps. “Out of the blue, Leeds United manager Eddie Gray came in for me and I was informed of his approach by Alex Ferguson. I had enjoyed my time with the Dons but it was alright sitting on the bench and collecting winner’s medals but I wasn’t playing football on a regular basis and to me that was the most important thing. Leeds United was very much in a transitional period. After suffering relegation from the top flight in 1982 under Allan Clarke, Eddie Gray was given the thankless task of rebuilding a club, which had fallen on hard times, with a shoestring budget. “I couldn’t wait to get started and we ran out onto the Elland Road pitch into an unbelievable atmosphere, the ground was full and the place was bouncing. More goals followed in wins over Cambridge United and Portsmouth. In January he notched the winner at home to Fulham and bagged two more the following week as Leeds gained revenge on Shrewsbury Town, following a 5-1 hammering at Gay Meadow, with a comfortable 3-0 win at Elland Road. The following month he scored in the reverse fixture at Portsmouth which saw Leeds win a thrilling encounter 3-2 and that goal proved to be Andy’s last in a Leeds shirt. In his first, and only, full season at the club Watson made 36 league and cup appearances, of which one was as a substitute, and he helped himself to seven goals from midfield despite missing six weeks of the season due to medial ligament trouble. The following campaign saw Andy start the first seven games but he lost his place in the starting line up after a 3-1 defeat away to Crystal Palace on the 29th of September and in December he returned north of the border to sign for Heart of Midlothian. Andy remained at Hearts until the summer of 1987 when he moved across the capital city to sign for bitter rivals Hibernian where he once again teamed up with former Leeds striker George McCluskey. “My time at Leeds United was fantastic and to have represented such a fantastic club on 43 occasions and score seven goals is something I will always be proud of. But in truth, the Leeds fans never really saw the best of me. Looking back I could have adapted myself better and showed a little more patience but what happened can’t be changed. “We had a side with a good mix of youth and experience. 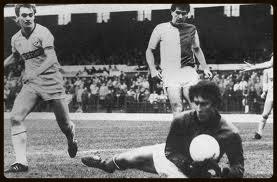 David Harvey, Peter Lorimer and Frankie Gray had returned to the club after playing their part in the heady days under Don Revie. Eddie was still registered as a player and he made the odd appearance. Along with seasoned professionals like Peter Barnes and Kenny Burns, they helped develop the raw talents of the younger players such as Scott Sellars, John Sheridan, Denis Irwin and Neil Aspin. “Everywhere we travelled the fans were with us in their numbers, the support was phenomenal but with that came huge expectation. It had been less than ten years since Leeds had played in the European Cup Final and we desperately wanted to get the club back to the top flight but it wasn’t to be. “Away from home, we were a soft touch on too many occasions but on our day we could match anyone in the division. After retiring from playing, Andy joined the coaching staff at Hibernian but moved onto Motherwell to become a member of Alex McLeish’s backroom team. Andy followed McLeish in a return to Hibernian and then to Rangers, before their involvement with the Scottish national side. The pair finished up at Birmingham City before Andy moved to Notts County. Currently, Andy lives in Birmingham and is not attached to a club but spends his time in coaching education and undertaking match analysis for Scotland manager Gordon Strachan. Thank you to Andy Watson for giving me his time and the opportunity to write this article.